Buchu, scientifically known as Agathosma betulina, is one of the most prized herbs that grows indigenously in South Africa. Buchu is endemic to the Western Cape, where it’s part of the unique floral kingdom known as Fynbos. Buchu has natural anti-oxidant, anti-inflammatory and antiseptic properties. It was used for its medicinal properties by the Khoi San people of the Cape, and then by the Cape Dutch colonists to whom they introduced it. Since then its popularity has spread and it is now used throughout the world to treat a range of ills. Buchu is taken in a wide variety of forms. Buchu tea is made simply by steeping the dried leaves of the plant in hot water. 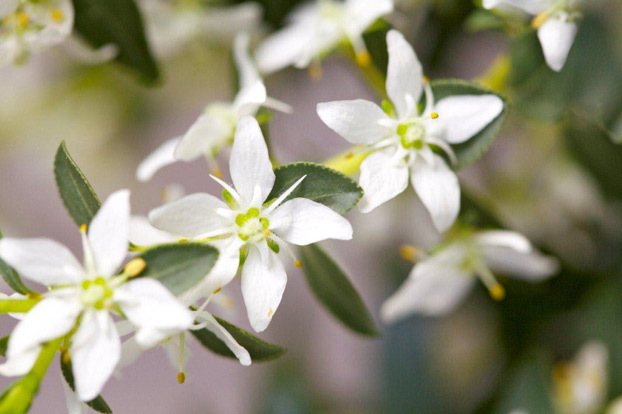 This releases the plant’s naturally zesty, liquorice-tinged flavour. Drunk hot, it’s enjoyed by many with a dash of lemon juice and a squeeze of honey. You can buy prepared tea-bags of buchu tea, or just buy or grow the leaves yourself, dry them, and steep them. Traditionally buchu is infused into Buchu brandy. This involves steeping a sprig of the plant in a bottle of high-quality brandy for a few weeks, allowing time for the natural anti-oxidants and anti-inflammatories – as well as the flavour of the plant – to permeate the liquor. You can also choose to buy a bottle of buchu brandy premade. Aside from simply chewing the leaf of the herb, the Khoi San would dry and crush the leaves, mix it with fat from a sheep’s tail, and use this ointment on their skin. They would also rub this salve onto open wounds and abrasions, and let the antiseptic properties of the plant do their work. Today a topical gel made from buchu extract is available. It’s used as both an antiseptic and an anti-inflammatory, and can be used to treat wounds, burns, eczema, bruising and nappy rash. It’s also useful for reducing the pain associated with injured joints or muscles as well as chronic joint conditions such as arthritis. Buchu water is used both within South Africa and around the world, in both personal and professional capacities. Thanks to buchu’s inherent vitamins, antioxidants and bioflavonoids, buchu water refreshes the body and mind. It also helps the body to combat free-radicals, thereby enhancing overall well-being. The buchu plant is enjoying new-found popularity in the culinary arts. It’s been used in shortbread recipes to add a natural, zesty flavour, and the head chefs at esteemed Le Quartier Francais have put together a distinctly South African flavour combination – buchu, rooibos and biltong. The biltong was used to coat a hake fillet, rooibos was used for the espuma – an aromatic and flavourful foam also known as a “thermo-whip”, and the buchu was used as a garnish for a home-made gnocchi and as a primary ingredient in a buchu and squash soup. Cape Kingdom Nutraceuticals produces two ranges of Buchu capsules – one that combines buchu and flax-seed oil that’s useful especially for treating urinary tract infections and another that combines buchu oil and salmon oil, for improving joint health.